On Friday, more than 300 activists campaigning for the University of Chicago Medical Center (UCMC) to build an adult Level I trauma center convened for a march and protest culminating in a rally outside the UCMC. The participants included both UChicago affiliates and other community members. They protested under the banner of the Trauma Center Coalition (TCC). The protests marked the end of the TCC’s “Week of Action,” which began on May 20 with a sit-in at a construction site near the UCMC. Other events during the week included an interfaith prayer vigil, a nurse-led bus tour of the South Side, and a doctors’ rally for a trauma center. 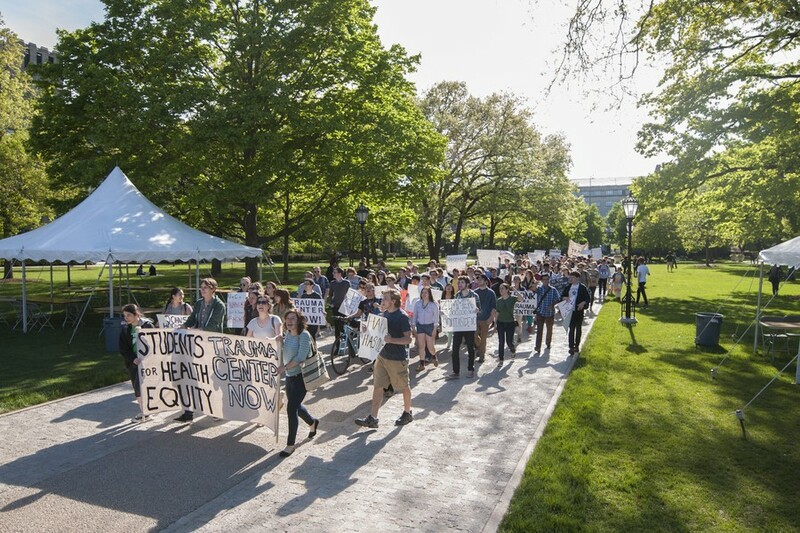 The TCC includes members of Students for Health Equity (SHE), the Woodlawn-based organization Fearless Leading by the Youth (FLY), Teamsters for Justice, and the Illinois Single-Payer Coalition (ISPC), among other organizations. The activists began their march at 4:30 p.m, at three separate locations: the intersection of East 61st Street and South Cottage Grove Avenue, the intersection of East 55th Street and South Woodlawn Avenue, and the Bartlett quad. Amidst chants of, “They say cut back, we say fight back,” and, “Hey, hey. Ho ho. Dean Polonsky has got to go!” the three groups of protesters then converged outside University President Robert Zimmer’s residence at the intersection of East 59th Street and South University Avenue. The protesters left Zimmer’s residence at approximately 5:15 p.m, and marched to the UCMC complex at the intersection of East 57th Street and South Drexel Avenue for a final rally at which coalition leaders gave a series of short speeches. Several protesters argued that the University’s ongoing bid to host the Obama presidential library without first building a trauma center is hypocritical. Veronica Morris-Moore, a member of FLY, criticized the University administration for its willingness to support new construction projects at the UCMC while maintaining that building an adult Level I trauma center is unfeasible. “The U of C cannot continue to expand and pursue a $800 million building or a presidential library…and say that they have no money for a trauma center. The problem is that they do not want to treat the uninsured. They do not want to treat the people who need health care most,” Morris-Moore said. University spokesperson Jeremy Manier contested the assertion that a potential trade-off exists between the University budgeting for new construction at the UCMC and the presidential library, because the University would not be directly funding the presidential library in the event that its bid is successful. At the rally, the activists also accused Doctor Kenneth Polonsky, executive vice president for medical affairs, of indifference toward the health of South Siders because of his public statements that an adult Level I trauma center funded and operated by the UCMC is unfeasible. In a statement issued on May 23, the UCMC asserted its commitment to providing health care on the South Side, citing the hospital’s burn unit, neonatal intensive care unit, and children’s trauma center as distinctive examples of important services provided to the South Side. “Developing a Level I adult trauma center could compromise the Medical Center's ability to support these critical services,” the statement said. Scott Goldberg, a third-year medical student, said that the fact that the University does not have an adult trauma center makes it an anomaly among peer institutions. “Harvard, Yale, Princeton, Johns Hopkins, I could go on…they all have trauma centers. I give the University credit for dealing with some of the health care issues within the outside community, but the fact of the matter is that we need a trauma center. I want a pledge from Polonsky and the others to make this a reality,” Goldberg said.